Observations from NASA's Solar Terrestrial Relations Observatory (STEREO) spacecraft show the sungrazing comet Lovejoy as it approaches the sun in December 2011. A comet with a death wish is set to skim through the atmosphere of the sun late Thursday (Dec. 15), likely destroying itself but offering a neat show to solar satellites. The comet is what's known as a Kreutz Sungrazing comet, or a "sungrazer," so-named because it will graze the surface of the sun. Comet Lovejoy is set to pass through the sun's intensely hot corona, within 87,000 miles (140,000 km) of the solar surface. This point of closest approach, called perihelion, is expected at 7 p.m. EST Dec. 15 (00:00 GMT Dec. 16). This close shave will most likely destroy the comet, experts said. "I'm still quite stunned by the fact that W3 is a Kreutz Sungrazing comet," Lovejoy wrote in a letter sent to the "comets-ml" mailing list. "This is a very special discovery to me as I have long been fascinated by the Kreutz Sungrazing comets." Though space rocks do fly into the sun fairly often, it's not often that astronomers get advanced notice of the encounter so they can train their satellite eyes on the event. Satellites such as the NASA/European Space Agency SOHO (Solar and Heliospheric Observatory) and NASA's STEREO (Solar TErrestrial RElations Observatory) spacecraft will be watching closely. "It's extremely rare to know about a sungrazer in advance,"Karl Battams, a researcher at the Naval Research Laboratory in Washington, D.C., wrote in an email to SPACE.com. "SOHO discovers a sungrazer on average every three days, but this is the first one in 40 [years] to be discovered from the ground!" The event is a special treat for scientists who study these special comets. "I have been working with Sungrazers for over eight years, and have been waiting for a large bright one like this to turn up," Battams wrote. "I wasn't sure if it actually would in my lifetime, given their several-hundred year orbital periods and seemingly random appearance rate, so I'm delighted to be seeing one now." Battams runs the Sungrazing Comets website, devoted to comets discovered by the SOHO and STEREO spacecraft. 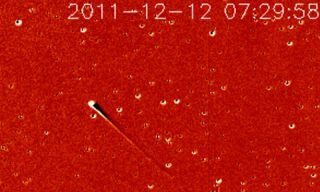 Data from NASA's STEREO spacecraft show the sungrazing comet Lovejoy in relation to background stars on Dec. 11, 2011. When the comet makes its death dive, it could become as bright as Jupiter or Venus, according to the site SpaceWeather.com, though the glare of the sun will hide the event from human eyes. "At such close range, solar heating will almost certainly destroy the icy interloper, creating a cloud of vapor and comet dust that will reflect lots of sunlight," according to SpaceWeather.com. Though comet Lovejoy's pass through the sun will be visible to SOHO and other solar observatories, it will most likely not be observable by skywatchers on the ground. "Obviously given that it is so close to the sun, the only time an observer could look at this object would be during the daytime, at which point it will be completely washed out by the blinding sunlight," Battams advised. "I guess there is a slim chance that it could brighten up far more than we anticipate and that observers could see it by blocking the sun behind, say, a large building. But I really do not anticipate this." IMPORTANT WARNING: Observers should not attempt to view the comet near the sun, or even point binoculars or telescopes toward it without appropriate filters, since doing so could cause serious eye damage.